Your asphalt surface is very durable and can tolerate pretty high heat, but that doesn’t mean that it is immune to UV damage. Typically, your asphalt surface will run at least 10 degrees hotter than the temperature outside depending on several variables, especially dependent on strength of sun on the given day. 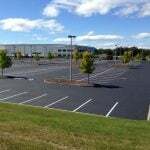 Asphalt sealcoating helps to protect your parking lot from damages associated with sun exposure like; decay, cracks, warping and deformities. As the UV rays from the sun fuses with the oxygen in the air, the chemical bonds that strengthen your asphalt instantly begin to break down. Now, while we say instantly, it is important to understand that although it will start almost immediately, it will take time to breakdown to the point that damages are visible. When UV rays begin to breakdown your asphalt, the asphalt surface becomes brittle, because the sun is essentially slowly drying out the liquid in the asphalt agent that keeps the aggregate together. This brittleness makes asphalt more susceptible to damages from water and winter’s freeze-thaw cycle. Surface Breakdown & Decaying – Sections of asphalt may become loose. Cracking – The main reasons for cracks in asphalt are from sun, water, and/or shifting. Under high heat, it is also likely that asphalt will swell which can lead to expansion cracks as well. 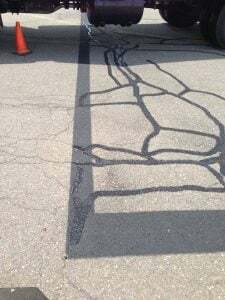 Warping – Asphalt may begin to spread to the corners of your lot and thin out over time because the tar in the hot asphalt mixture begins to melt when heated to high temperatures. Melting/Disfigurement – Your asphalt may begin to warp or take on a different shape due to this melting. It is important to understand that sun damage to your asphalt is inevitable and that there is no solution that will completely stop it from happening over time. 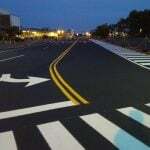 However, asphalt sealcoating is the most effective way to slow down the process, extending the life of your pavement. 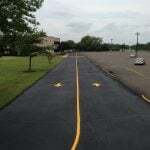 Asphalt sealcoating is the process of applying a protective barrier on top of the asphalt to help shield it from the elements and various chemicals it may come in contact with. 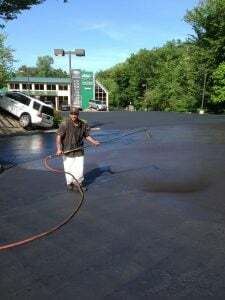 Your asphalt sealer will help to protect asphalt from water by resisting water seepage to the base of your lot, while also slowing down the oxidation caused from UV rays. Asphalt sealcoating can also help to protect your asphalt surface from damaging spills like car oil that can further break down your asphalt. 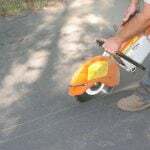 There are a few things that you will need to do to prepare your lot for asphalt sealcoating like; cleanup, lot inspection, identifying problem areas and cracks that need filling, and making sure your pavement is dry before applying asphalt sealer. Read more on these preparations in our blog, How To Prepare Your Asphalt For Sealer. EastCoat Pavement Services uses the most advanced asphalt sealcoating process to help add years to the life of your asphalt investment. Asphalt sealer dries fast and can be done in sections, which means minimal traffic interruptions for your commercial parking lot. Asphalt sealcoating can not only help to protect your asphalt from damages, but it can also increase your property’s curb appeal! Now is the time to sealcoat your asphalt surface before the high heat of summer hits. Contact EastCoat Pavement Services today for your free consultation and let us help protect your lot for summer!